It is another win for the White House administration and marks the end of a two-year prison term for the innocent North Carolina pastor who was detained by Turkish authorities for his alleged involvement in the military coup two years ago against the government of Turkish President Erdogan. The native of North Carolina had worked as an evangelical Presbyterian pastor at the Izmir Resurrection Church and his release had been demanded both by the Vice President Mr Mike Pence and Secretary of State Mr Mike Pompeo on multiple reprises. Mr Brunson had lived peacefully in Turkey for more than 23 years with his wife and three children. A Turkish court decided this afternoon to free the US pastor after the government of Mr Erdogan agreed to drop all charges against him. 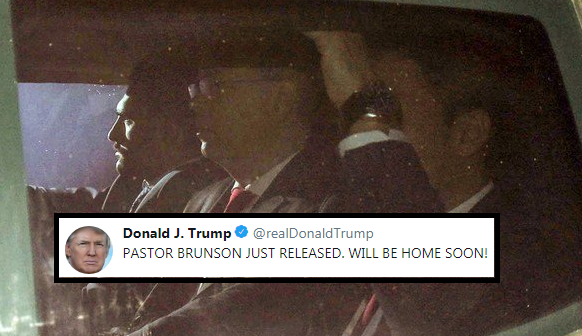 The case has been at the center of deteriorating relations between Turkey and the United States, heightened by President Donald Trump's defense of Brunson as his administration elevated religious freedom as a cause. Before the verdict was announced Mr Brunson was allowed to meet his wife in the courthouse, where they held hands and talked about the possible outcome. Wearing a dark suit and red tie, the pastor stated: "I am an innocent man. I love Jesus. I love Turkey." Shows that the Pres. Is a man of his word and never backs down from injustice! WOW!!! SUPERDUPER!!! THATS MY PRESIDENT!! !KEEP ROCKIN IT PRESIDENT TRUMP!!! WWG1WGA!!! You cannot trust in words & rhetoric, Yet deeds always point to true character. Common sense tells us that. It is also why the powers that be wish us to have none. So they may continue to act against us in the guise of our benefit.